Hearty Venison Chili is a dish that’s pure comfort in a bowl. It’s thick and satisfying with just the perfect blend of cumin, chili, herbs, and spicy heat. Your taste buds will stand up, take notice, and thank you for every spoonful. 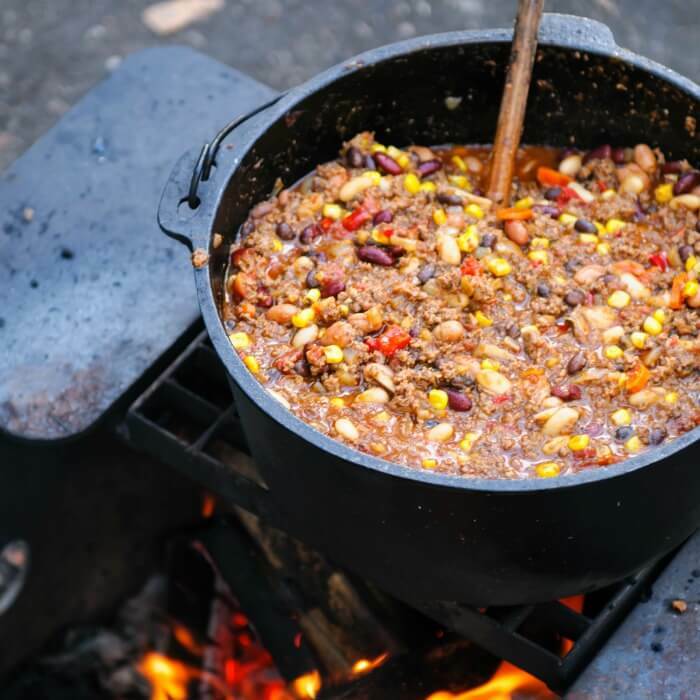 Chili with meat is a single pot stew that epitomizes campfire cooking. The stew has been around for centuries. In fact, the stew’s long, rich history includes a bit of mystery. The story tells of a mystic Lady in Blue, Sister María de Ágreda. She never left her home country of Spain but, in 1629, 50 Jumano Indians said she appeared to them in the wilds of West Texas. It was the Lady in Blue who taught them how to make a fiery red stew. Now that stew must have contained some pretty potent peppers!! Then came the Spanish priests who didn’t appreciate the potent stew. They called it “soup of the devil” and preached sermons against eating it. Was the soup devilishly good or devilishly powerful? I don’t believe the Texans agreed with the Padres; they continued to make the stew. By the end of the Civil War, chili joints opened up all over the country. Anyone can create a delicious pot of hearty venison chili. Just three things are necessary for it to be chili: a ragu of meat, hot chili peppers, and cumin. The rest of the ingredients you add build layers of flavors to the dish. 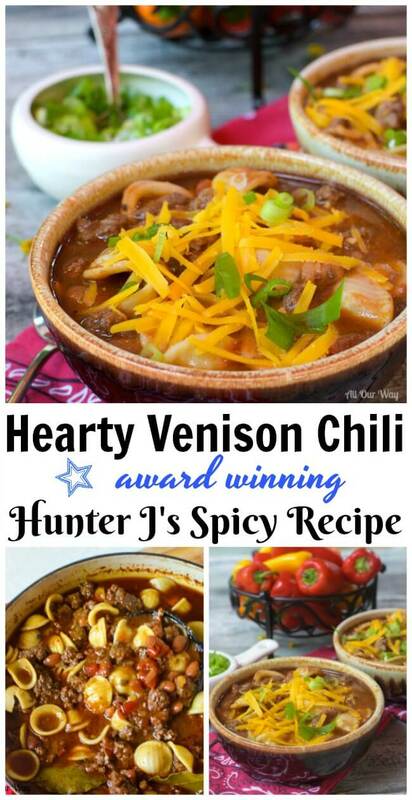 Once you have the blueprint for Hearty Venison Chili, you can create your recipe. Now, chili is not the type of dish that uses precise measurements. Hunter J gave me the ballpark amounts he uses. A large wooden spoon and a big pot. Protein: a combination of venison and sausage. You may mix and match with other meats. Aromatic Vegetables: this builds flavor. Onion is important as well as garlic. Add chili peppers, and variety is nice. Don’t forget, the smaller the chili, the more potent it is. Spices and Seasonings: Cumin is the most important here. Ancho chili is great with the cumin, but you can add your favorite chili powder. Dried oregano, thyme, bay leaves, are a nice addition. Liquids: beef broth, chicken broth, water, even beer. Tomatoes: this is a good way to add flavor. Use sauce, paste, chopped tomatoes, even Ro-tel tomatoes (our favorite). Other additions: we like to add beans as well as some small pasta when serving. That’s just our preference. In Dutch oven sear the meat until brown and fragrant. Don’t overcrowd. Remove meat. Add the aromatics and sweat the vegetables until soft. Put the meat back into the pot. Add the spices you want. You can add more later if needed. Add the tomatoes and or sauce you want to use. Cook until the meat is tender and you have the thickness you desire. Taste and adjust the seasoning. That’s all there is to it. Easy, right? Just think, chili began as a hearty dish on the Western frontier and its now become a stew everyone wants to master and make as their own. 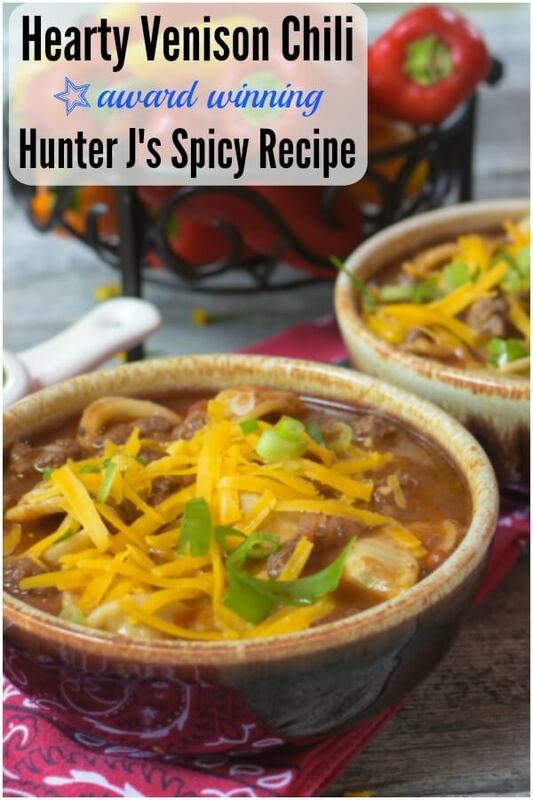 We hope you give Hunter J’s recipe a try. Serve it with some of our crusty rolls. You won’t regret it!! A hearty stew made up of ground venison meat and sausage with a delightful combination of herbs and spices. The meat is slow cooked and full of flavor. The balance and flavors are mouth watering good and you can control the heat of the stew. *Optional sour cream and shredded cheddar cheese. Heat the oil and butter in a large pot or Dutch oven. Add the venison and sausage and cook about 10 minutes, stirring to break up the pieces. Stir in the onions, garlic, and jalapeño pepper and continue to cook until tender and translucent. Add the cumin, chili powder, oregano, thyme, bay leaves, adobo sauce, salt, and pepper. Stir well. Cook for about 10 minutes. Add the beef broth, chicken broth, tomato sauce, Ro-Tel tomatoes (or regular tomatoes) and bring to a simmer. Simmer for 60 minutes, stirring often. Add the beans and continue to simmer for an additional 30 minutes. Taste and see if the chili needs any additional seasoning. Before serving add some cooked pasta in the bottom of a bowl then pour the hot chili over it. You may add some sour cream and shredded cheddar cheese, if you like. Note: Recipe and content from © 2017 All Our Way are copyright protected. Please do not use content or recipe without prior written permission. If you want to share the information, please link to this post. Grazie. Let’s stay connected. Sign up for our weekly newsletter so we can share what’s happening with us, and we’d love to know what’s going on with you. This chili is so amazing I am making it again with in 2 weeks of each other. Something about a big hot bowl of venison chili, watching the snow fall and the wood burning stove just says Comfort food for the Soul. I used 2 lbs of venison burger along with 1lb of venison sausage for this 2nd round instead of regular sausage and WOW what a big taste difference! And for the beans I used 1 can of chili beans and 1 can of red kidney beans. Everything else remained the same. Hi, Tara! Thank you so much for your sweet comment! I’m so glad you like the chili!! Your chili sounds great. We’ve used venison sausage too instead of regular sausage and the dish still comes out great. Thank you for taking the time to write — I would love to hear more about your recipes. Wow – I made this for a chili cook-off event at work and this dish stole the show. I used a combination of pork sausage, venison and deer sausage (keeping with the proportions). We also made a chipotle paste, akin to the adobo sauce recipe. The ingredients and combination of spices & herbs are the real-deal. Thanks for posting this recipe! Absolutely fantastic! Thank you so much, Shibby, for letting us know. That’s wonderful!! I’m so happy for you. Keep in touch! I was looking for a recipe to use the venison burger we have. This is the most delicious chili I’ve ever tasted! I normally don’t even like chili. Thank you! Hello, Rochelle! Thank you so much for your sweet comment. We also love the recipe. If you like Shepherd’s Pie, we will be posting a recipe using venison. We will probably call it a Cottage or Hunter’s Pie. What do you think? Thanks for this recipe, I made it for a chili cook off an came in 3rd place. Absolutely loved it ! That’s wonderful, Deanna!! Congratulations and I’m so pleased. Thank you for sharing the good news. I love to cook with venison! I have some in my freezer that I need to cook up but needed something new to try it in! This is perfect! This came around again on Pinterest – and reminds me that, now that I’ve moved, time to look for a local source of venison here in North Carolina! 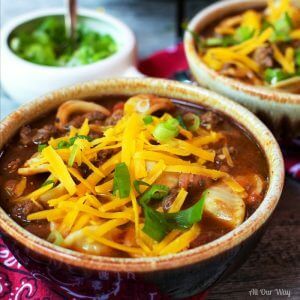 I’ve had venison chili, years ago, and it had so much flavor – I”d love to be able to make it myself!. There’s nothing like a big bowl of hearty chili. I love the use of venison for this dish. I really enjoyed reading this post! The history was such fun, and your explanation of how to build the chili, thinking of it like a “blueprint” is a great way of explaining how the basic foundation can be tweaked and customized for personal preferences. 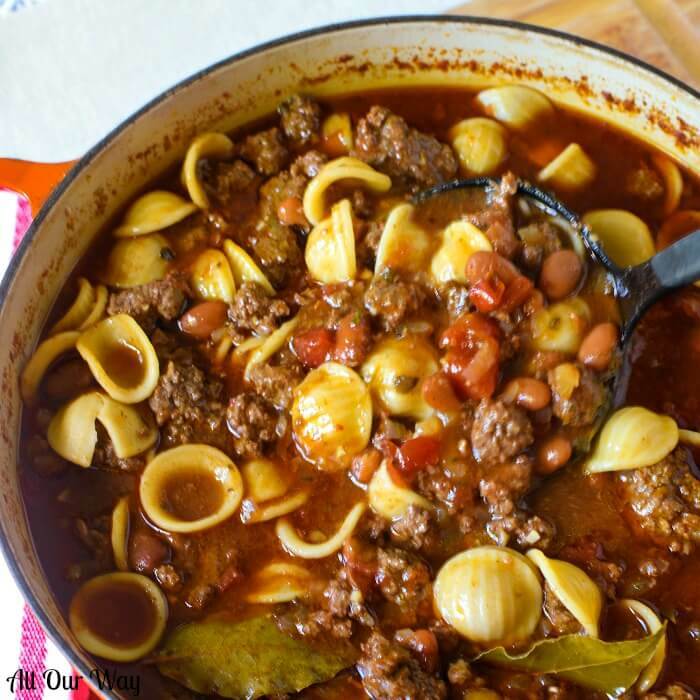 And BTW, I definitely love serving chili with pasta, too – yum! Venison is something I don’t have too often. Back when I lived in Wisconsin, there were so many deer hunters that we had it fairly often. I’ll have to keep an eye out for some here in New York – this chili looks SO wonderfully comforting. Wow that just looks like the best comfort food!! Can never say no to a good chilli!! I adore venison but I’ve never made chili with it. I’m so glad I came across your recipe because it looks so delicious and hearty!! I love a good, hearty chili like this. Especially one that has a little bit pf jalapeno for a kick. I’ve not made a chili with venison but it sounds divine! Growing up in Wisconsin, we at a LOT of venison. This chili looks awesome! This looks like the perfect comfort food! Can’t wait to try it on a fall/winter night! Hi, Leslie! Yep!! Cheese is great on top and the flavor is sooooo good. Chili is always so great on cool fall days! The addition of venison to this version makes it a bit unique! The recipe is great, Kathryn. But if you don’t have venison it is also good with beef. Pictures make me drool though I have never tried Venison but Loved how this chili has turned out. This sure looks hearty and healthy and delicious! The flavor layering looks amazing! Oooh!! That does sound good, Dawn!! Have not tried Venison yet, but I am willing to have a taste if available. Unfortunately, we are not hunters, so there is a slim chance I’d ever taste it anytime soon. I heard though that it is healthy and very lean, so I enjoyed reading this post today. Hi, Shobee. If you don’t have venison you can use beef in its stead. I have yet to try venison. We don’t have any hunters in the family. I will see if my neighbour has any in his freezer. 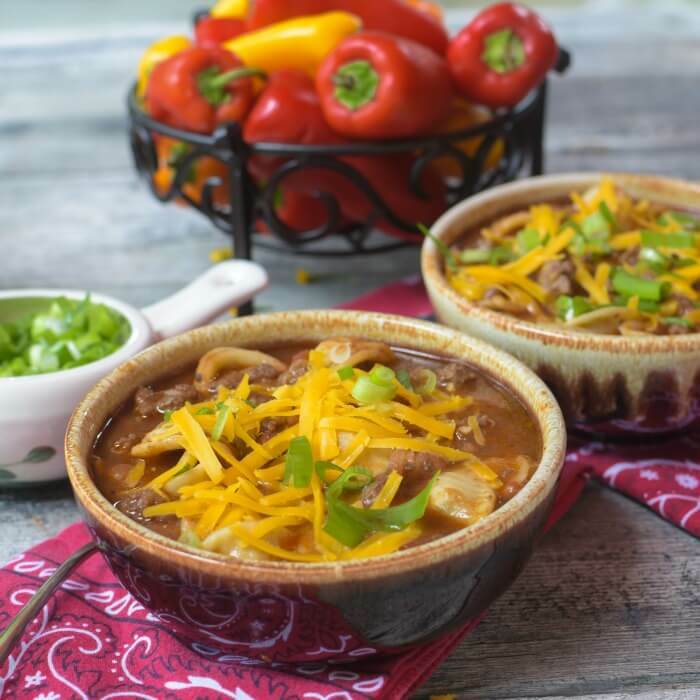 Chili is the perfect comfort food…and I bet the venison takes it to a whole new level of goodness. I can’t wait to give this try! A friend of ours always tries to give us venison after hunting season and I”m always weary about taking it because I don’t know what to do with it. This looks so good and like something my son would eat which is a big plus! Wow! Who knew chili had such a fascinating history (I sure didn’t)! And this one looks particularly delicious! Thank you, Claire! It is amazing the history of some of the foods we eat. Happy Sunday! I didn’t know about the sacrilegious origins of chili con carne. Soup of the devil? Lol, great story! I’m hoping to have some venison to put up this fall, and now I the first recipe I want to make with it. This looks so good! Just in time for hunting season, thanks for this! I like your chili making method, layering the flavors. That’s what I really love about French cooking, the flavor layering. Looks amazing! Hi, Tina! Thank you! As you said, layering the flavors enhances the final taste. We are planning some more interesting recipes using venison. A hint — one of the recipes will include a duxelles in it. Coming from a family full of hunters this is a perfect recipe. Definitely adding this to the rotation of recipes! I’m still not brave enough to try venison, but I love chili, so I might have to use chuck instead. Hi, Cheryl! Seriously, the venison does not have a funny taste! It is delicious but this recipe is also good with beef. Whatever you prefer. Hope you’re Sunday is going well. I agree, Anne! We love our chili — a great comfort food!! I’m hoping one of my brothers gets a deer this year because this chili looks delicious! I love that you added the pasta and the spice. Marisa, this is a perfect autumn dish. I’ll have to make it with beef, and I’ll add beans. I’ve never heard of anyone adding pasta to chili – you may have invented something! Must try it next time – what’s not to love about pasta! You’re right, Jean. Pasta always adds a special note to a dish! Have a nice weekend. Chili and fall perfect comfort food! We love chili and this would be a prefect winters meals for us. I’m going to make it with beef though cause I don’t get venison meat here. Love the color you have here. Can’t wait to try this. I agree, Veena! Nothing like a hot bowl of chili to warm you up from the inside out. We do too, Dixya! We not only add beans but pasta too. Have a nice weekend. Yeah! It’s fall and we love homemade soups😊….I just finished my grocery list with Tex Mex ingredients….I plan to use your recipe to modify mine….I know my gang would love the heat. This looks so good and reminds me of a chili my dad used to eat when I was a kid. It’s also something my husband and son would like. This is such a great family style recipe. Adding to my list of recipes to make this winter. Thank you, Chiara! I wish I could send you a big pot for you and your family. We call it our comfort food since it certainly warms us up. Buona giornata e un abbraccio forte. Oh man. My mouth is watering big time! It’s going to be chili night this weekend!!! Hi, Elizabeth! If you and your family are into spicy — this is it. If not, you can modify. Big Hugs!! For years, I didn’t realize that cumin was the flavor I was missing from my Chili. Once I figured that out, I loved my homemade chili. I wish we knew some hunters, so I could make this venison chili. It sounds delicious. I guess I’ll just have to make it with some other meat. I love a spicy chili dish like this and I love the food history of the Lady in Blue. I need to send my hubby out for deer season this year for sure! Thanks for sharing a great recipe! I had never heard the story about the Lady in Blue, but that was a fun read. 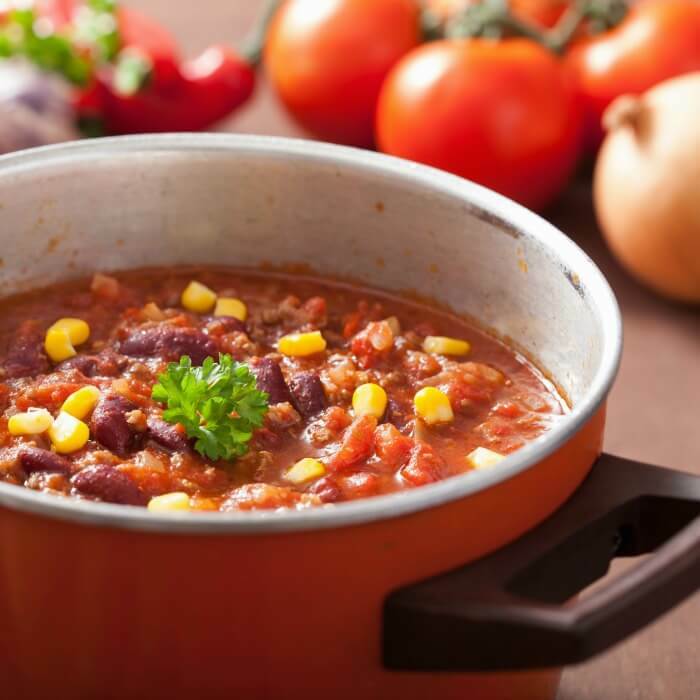 Love a good pot of chili – this one looks great! Thank you, Jenni! It’s really a great recipe and if you don’t have venison you may use beef. Nothing beats a great chili during comfort food season. I have never tried venison …. in anything. I just might have to ask my neighbour the hunter for some meat. Love the sounds of this tasty recipe. Can’t ever go wrong with a pot of chili on hand. This recipe looks delicious and full of flavor. Thank you, Jovina! It’s super tasty! Looking forward to more soup season.